When I was 11 years old, I was invited to take part in a programme which offered college-level summer courses for children in a variety of disciplines. At the time, being a math nerd, I really wanted to take a course in calculus, but my father persuaded me to take on a creative writing programme instead, reasoning that it was a subject rarely taught in formal education, at least at the pre-tertiary level. I have never regretted following his advice as that three week programme was one of the most enlightening experiences of my life. In my opinion, creative writing is a highly underrated field of study. Creative writing not only improves literacy by strengthening grammar and vocabulary whilst encouraging a love of literature, but also encourages the writer to exercise his or her imagination and examine a narrative from different perspectives. This means learning to think critically, learning to plan carefully, learning to communicate effectively and learning to empathise with other people, all of which are skills that will be useful to any child or adult. And…it’s fun to make up stories. 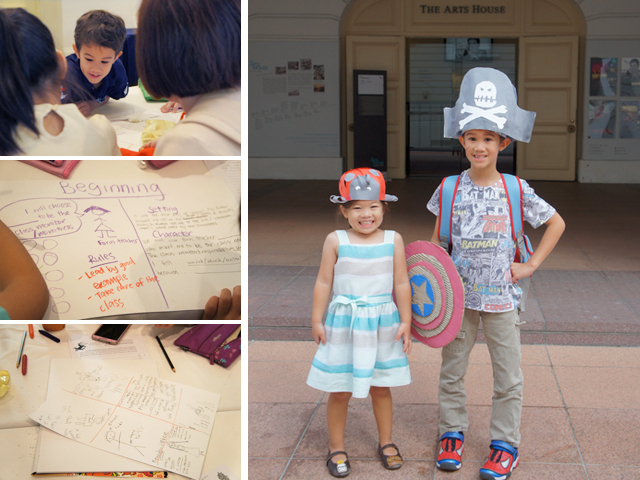 This is why, when Monsters Under The Bed invited J to attend their EpicQuestINK creative writing camp at The Arts House over the March school holidays, I was really happy and excited for him to have this wonderful opportunity! Monsters Under The Bed is a writing school founded and taught by professional, published writers. During the year, they run both regular weekly in-house classes in both creative writing and expository writing for students (and adults) as well as holiday creative writing camps for 7-12 year olds known as INK (Imagination & Knowledge) workshops. The INK workshops all have different themes which are not repeated in order to ensure a unique experience each time, and the trainers use a combination of roleplaying, group discussions and writing exercises to get the kids involved and passionate about their own stories. 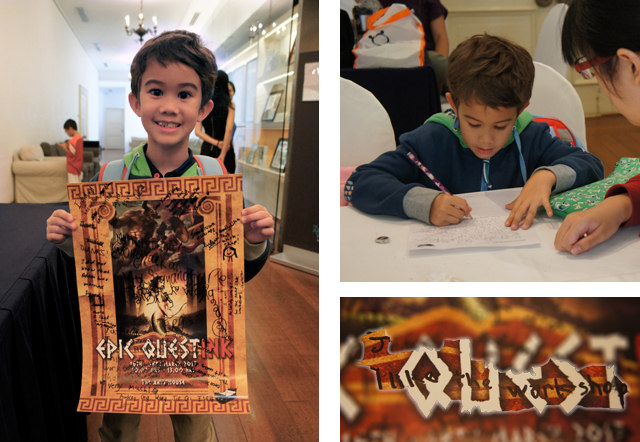 The theme of EpicQuestINK was based around Greek myths and legends, a subject that J is familiar with, and the focus of the workshop was aimed at teaching the kids how to utilise the concept of the monomyth, or “Hero’s Journey”, in order to formulate a complete and comprehensive narrative. Through the age-old stories of heroes like Heracles, Theseus and Perseus and their battles with fantastical creatures like gorgons and minotaurs, the kids would be inspired to formulate their own protagonists and antagonists as well. One of the first rules of the INK workshops is that the trainers do not try to revise or over-simplify the subject matter just for young children. They feel that by doing so, they would be lowering both reading and intellectual standards. Instead, they work alongside the kids, guiding them towards understanding the topics, thereby helping to stimulate and open up their young minds. In fact, preparation for the holiday course began long before the first day of the course. Imagine my surprise when J received an email about one week before the start of the course, addressed to “Titans and young Mubster Agents” and inviting him to “ascend Mount Olympus” with his “modern stylus and wax tablets”. Needless to say, he was immediately intrigued and asked me if he had to bring special shoes for climbing! as well as four pages of very beautifully written preparatory reading material (to be read together with a parent, of course) consisting an overview of the Hero’s Journey as well as some questions to get J thinking deeply about his own personal experiences and how to apply this personal knowledge into his stories. By the time the first day of the workshop rolled around, J was already brimming with excitement and ready to learn! At the start of the first day, the children were shown a Percy Jackson video clip. The chief trainer then proceeded to give a brief college-level lecture on Greek Epic Poetry complete with powerpoint slides and quotations from Homer’s Odyssey. To my utter surprise, the main speaker was not only able to engage a large group of primary school children who were completely mesmerised by him, but he also held the attention of 4 year old Little E who was sitting in the back with me (parents are allowed and encouraged to sit in to observe the workshop at the back). After the lecture, the class then split into small groups by age and writing ability. The trainers who managed each small group began to lead the children into avid discourse on the topic and it was clear that they were very quickly able to encourage the children to share their thoughts and ideas. By the end of the day’s session, I noticed that even the most shy child in J’s group was actively involved and freely participating in discussion. What sorcery is this?! In fact, after the class that day, J was able to tell me all about the different stages of the hero’s journey from “the call to adventure” to “receiving a boon” to “completing trials”, as well as examples of each that he had personally dreamed up during the small group discussion. He could barely wait to return to the workshop the next day! On the second day of the course, the kids were encouraged to come dressed as a hero or villain as Monsters Under The Bed often incorporates a little bit of roleplaying and dramatisation into their workshops, which is not only fun for everyone but also helps when considering character development in creative writing. When J returned home at the end of the last day of the course, he had completed a three page short story (involving the first day at school, a fire-breathing school principal and a tiny Pegasus that you can keep in a backpack) on which his trainer had written some useful comments and tips for further improvement. He was so excited about his work, that once he got home, he insisted on revising the story one more time in order to take into consideration the advice given by his trainer. He even woke up extra early in the morning and when I got up at 6am, I found him labouriously copying his final version of the short story into a blank book. Since then, J has even started writing another short story entirely of his own accord during his free time, using the methods taught during the EpicQuestINK Workshop. I was surprised when he sat down and wrote out character sketches, a plot outline and then afterwards, drafted out a complete story, all of his own accord. Not bad for a 7 year old kid, I think! You can register for the workshops online or contact Monsters Under The Bed at +65 6100 4363 or via email to riza@mutb.com.sg. Also, do check out their Facebook page for more information on their previous INK workshops as well as their blog which is chock-a-block full of great writing tips! As you can tell from J’s response to the workshop as well as the comment he wrote on the EpicQuestINK poster (which you can see at the top of this post), he thoroughly enjoyed himself and has since been asking me if he will be able to attend another INK workshop in the future! Big, BIG thanks you to Monsters Under the Bed for inviting J to EpicQuestINK – J thanks you for the EPIC experience and hopes he will be able to be back for SurviveINK in June 2015 for more inspirational creative writing fun! P.S. Check out these reviews by Life’s Tiny Miracles and Tan Family Chronicles on previous INK workshops!